It’s that time of year and I’ve been doing a lot of fishing with popping bugs. So I thought I would share a few techniques I use when popper fishing. None of these are original ideas and you may already use several if not all of them, but they are all proven methods of nailing fish and probably worth revisiting. -First, and probably foremost in my opinion – fish these flies with patience. My experience is that a popper fished slowly and with some subtlety takes more fish. Sure, these bugs can be fished aggressively with great commotion and draw strikes, but I almost never start out that way. I usually begin with very small twitches of the popper followed by lengthy pauses. Sometimes these twitches are so subtle that the fly just scoots across the water for a couple of inches, only making a small wake on the surface of the water with no popping or chugging. If this approach fails to get the interest of the fish, then I gradually get more aggressive. I’ll strip and twitch the fly more sharply so that it creates a greater disturbance on the water, and I’ll shorten the pause between strips. I usually find that I don’t have to get too aggressive to draw strikes. This is especially true on slick, still water. The fish in that type of water are often wary souls. If I start fishing the popper aggressively right off the bat, I probably spook many of those fish and never get a shot at them. an intermediate sinking line. Yeah I know – this sounds a bit counterintuitive, but this technique can really nail some fish. When fished with the intermediate line, a popper will dart a few inches beneath surface, trailing a line of bubbles, and then slowly rise back to the top. Drives bass insane. Insane I tell you! Actually, this is an excellent technique to use with any buoyant flies like poppers, boobies, etc. -Fish a popper/dropper combo. Just like it sounds – drop a subsurface fly from the popper. For bluegill fishing I like to drop a large nymph, say a size 8 or 10 pheasant tail. 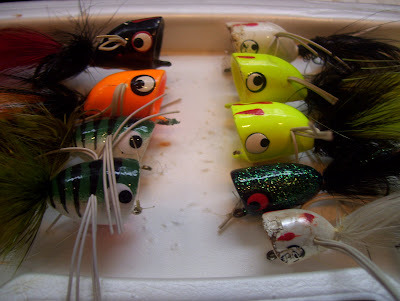 For bass, I’ll drop a baitfish pattern like a white woolly bugger or even a small clouser. I find this to be especially effective for bass in the late morning as the fish begin moving out of the shallows and the top water bite is tapering off. The dropper can extend the morning’s fishing for another hour or two. Experiment with your retrieves. As I mentioned above, part of this is starting off slowly and methodically, gradually getting more aggressive as needed. Also, vary your pauses between strips. Vary the number of strips and twitches. Sometimes only give the fly a very subtle twitch, barely causing the fly to move at all. Or if the situation calls for it, move the fly hard enough to get that big “galoop!” sound with the resulting bubble trail. Last evening I lucked into some great top water fishing by playing around with different retrieves. I caught several spotted bass on a local river by swinging a popper through the main current rather than twitching it and popping it through the water. I fished the popper just like a streamer, casting across and letting it swing down. There was no popping or gurgling, just a huge wake as the big bulky fly cut through the surface. The bass were absolutely hammering it. Interestingly, I drew very few strikes if I stripped the popper at all. So these are some things I like to do when fishing poppers. Give them a try if you’re not already doing so. Maybe some of you have other techniques for these flies. I would love to hear them. Shoot me an email at finewaterflyfishing@gmail.com and I’ll post them for you. If they’re really good, I’ll pretend that I came up with them and take full credit.